Recently, one of our customers came to me to ask about setting up a VPN for some of their clients. He wanted a secure way to let his clients access the resources that they needed – and only those resources. Unfortunately, every client needed to access different devices and they wanted a way to manage this as easily as possible, preferably without having to make changes to the firewall every time they needed to add a user or change what resources the user could access. They also did not want to store this in their production Active Directory environment. Create a way for clients to connect via VPN and only give them access to specific network resources. Make it easy to manage, without having to constantly make changes to the firewall every time a new user needs to be added or access lists for the VPN need to be created/changed. Use AD LDS (Active Directory Lightweight Directory Services) from Windows and setup LDAP Authentication on the ASA using this AD LDS instance for authentication. Use an attribute in AD LDS to store the ‘access list’. AD LDS is a directory service that runs inside of Windows, separate from your actual Active Directory. This article explains more, I’ll be referencing it a few times in this blog post (This article was written for Windows 2012 R2). This solution provides the ability to manage users and their access easily, within a separate directory that is not part of their normal Active Directory environment. Additionally, it does not require constant changes to the firewall. Minimizing changes on the firewall minimizes the possibility of human error and possible misconfigurations or worse, downtime. It is important to note that for this setup you should use LDAPS, also known as “Secure LDAP”. LDAPS is a secure/encrypted connection for your LDAP protocol that runs on TCP port 636 instead of the standard TCP port 389. In the article, there are references to the LDAP protocol but the underlying connection should be setup using LDAPS. When setting up the new instance you’ll be prompted to import the LDIF’s, pick at least one of these two. Create a user for the ASA to connect to for LDAP lookups in the new Users OU. After creating the user, right click on the user and choose “Reset password”. Add this user to the ‘Readers’ role in the AD LDS Instance. Do this by taking the “DN” of your ASA user (e.g. CN=ASA,OU=Users,O=VPNAuth) and add it to the “member” attribute of the “Readers” role. Create a VPN user in this OU. Again, set the password. Setup AAA Server group and server for LDAP. Pick an attribute to use for the mapping. In my case, I used wWWHomePage. This is the attribute where we will store the Cisco-AV-Pair, which is where we store the access list. Setup AAA Server in server group. Now, in order to configure access to specific devices, we need to setup the Cisco-AV-Pair. For this example, I’m limiting access to the 10.255.100.30 IP address. So in the wWWHomePage attribute, I set the following: Log-in and test. Verify that you are only allowed to access the resources set in the Cisco-AV-Pair. You can easily add new users and setup their access list by using ADSIEDIT. This can also be simplified by using PowerShell. You can build scripts to quickly add users, delete users, disable users, set the access, etc. If you find when you try to log in and it fails instantly, you probably had a problem with your Cisco-AV-Pair. Try clearing the attribute and then authenticating to the VPN again. If it works, you know you probably have a syntax problem with your Cisco-AV-Pair. Otherwise, make sure your ASA user along with the VPN user has a password set that conforms to your password policy and that the user accounts are enabled (check to make sure the msDS-UserAccountDisabled attribute on the user objects is set to “FALSE”). To help troubleshoot, run ‘debug ldap 255’ on the ASA. Paste using an application that converts linefeeds to UNIX style. The easiest way to accomplish this is to use something like Notepad++. 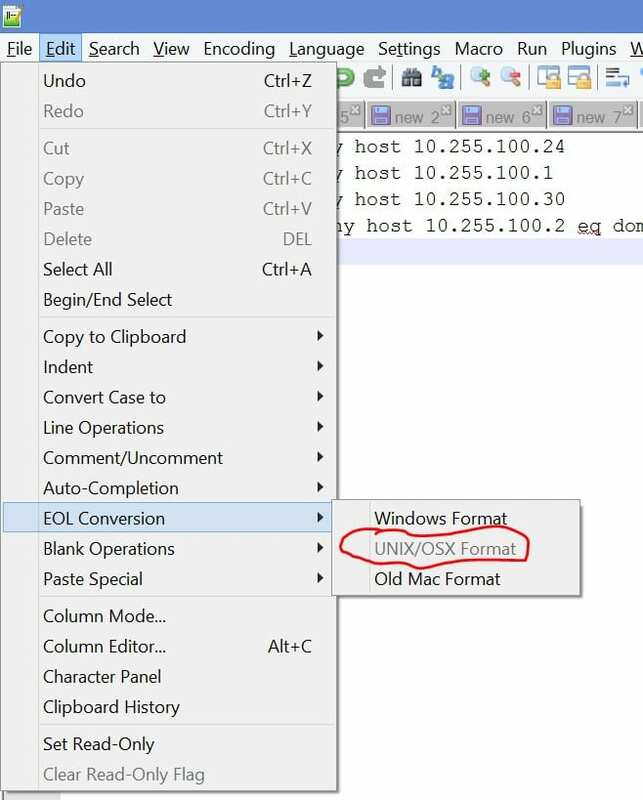 In Notepad++, change the EOL Conversion to ‘UNIX/OSX Format’. You can then paste a multi-line string into the attribute. Note: the wWWHomePage attribute will only accept up to 2048 bytes. If you need a larger access list, you may need to use a different attribute. To further enhance this solution, you could use PowerShell scripts to take care of the adding/deleting/disabling of users and setting the Cisco-AV-Pair attribute. If you have any questions or need help implementing any of the technologies mentioned above, email info@peters.com. We are happy to help! For additional information setting up the Cisco-AV-Pair rules, see here.